Back in January I wrote about the importance of self-care and some things I vowed to work on myself. 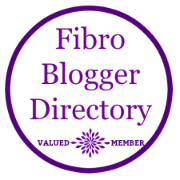 As May is Fibromyalgia Awareness month, I decided it was time to check in and see just how good or bad I am doing on my own self-care. Practice what you preach, and all. I have found more success following strategies for healthy living, than I ever did taking a pill that the doctors prescribed. So taking care of myself has to be my number one priority, in order to minimize my fibro-flares. You cannot, after all, drink from an empty cup, and having a flare can often feel like you are running on empty. Sleep – I am still not getting enough, but of course some of that has been neck pain-related. I am getting better about not watching the news as much before bed and turning off the alarm on the weekends to let my body sleep. I also am finding I am not waking up as much during the night as I used to. Granted, that may be due to the occasional muscle relaxer for my neck pain, but whatever the cause I will take it. Work – This is a hard one. I am still working too much and eating at my desk most days of the week. I am in the middle of a managing a software upgrade project right now, so extra work on top of my already busy day. I really want to get better at this and walk away at the end of 8 hours. I have been getting away from the office one day a week for lunch and doing mid-day exercises at my desk, but I am still shooting for two lunches away or even a lunchtime yoga class! Religiously using my foam roller for my back, hips, and legs every day. This self-myofascial release significantly helps the pain and work out the knots, and I am not having as many flares in my hips and legs. You can find a lot of exercises on Pinterest and Youtube using your foam roller. I also have a standing desk at work that I use several times a week. They say sitting is the new smoking, so I try to stand as long as I can do it without pain. Regularly working out at home – yoga, walking, elliptical – several times a week. Grocery shopping online – I did this once. They didn’t have several items in stock and did not substitute and I received moldy strawberries. So I still had to make another trip to the store. I can see where this would be handy for staples though, to keep a running list made, but I actually enjoy perusing the aisles at the grocery store. Web surfing – I do still seem to lose track of time some weekday mornings, but I had significantly cut back on my use of social media. Finally, I want to recognize another blogger who created a great campaign idea for the month of May. Brandi over at Being Fibro Mom developed the Shine a Purple Light for Fibromyalgia concept and #ShineforFibro hashtag, which I have used on a few tweets this week. So pop on over to her page using the link above and read what she has to say. How are you doing on your self-care? Are you staying strong? Really great post 🙂 enjoyed reading this and can’t wait to read more from you ow we’ve been connected!